About two years ago, I self-published a children’s photo book called Too Fly Not To Fly with my friend and co-author Briana McLean. As we were both teachers at the time, our goal was to make a learning tool that would forever serve as a source of critical thinking and encouragement for young Black children to believe in themselves no matter the circumstances. High self-esteem and creativity were the seeds we wanted to implant within each student. Today, this book lives in every one of the Chicago Public Library branches, listed as one of CPL’s Best Picture Books of 2017 and Kids Staff Picks (October 2017). As an advocate for education, I continue my effort to pay it forward by serving as a mentor and part-time instructor to students at Betty Shabazz International Charter School. My goal, or what I feel to rather be my responsibility as a Black man and community member here in the city of Chicago, is to continually invest in education however I can to help ensure that CPS students flourish. My newest effort is “We Real Cool,” a uniform project. I’ve always been intrigued with the language of clothes and how they can speak. The old concept “if you look good, you feel good” has always been a notion that I find to still be very relevant today. Taking this idea of looking good and feeling good as the foundation, I thought it would be interesting to see if I could help in changing the narrative of school uniforms from being boring and lame to something more meaningful, fun, cool, unique, and most importantly, culturally relevant. 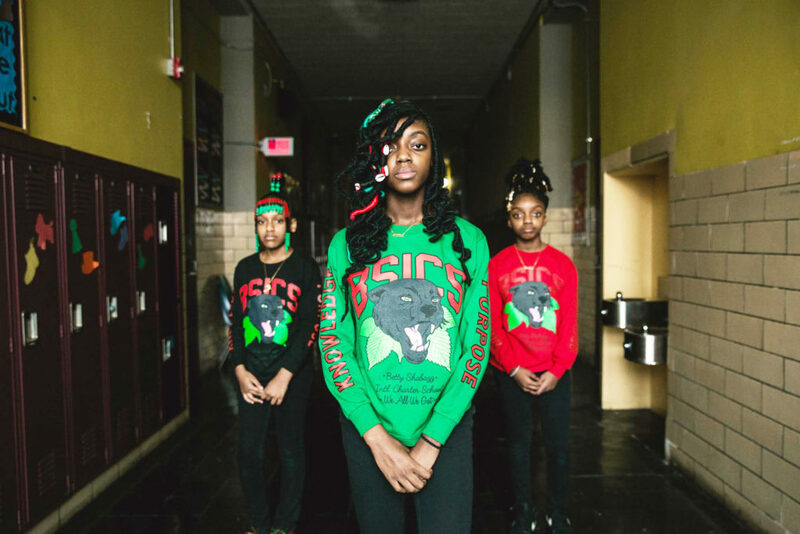 So, I took it upon myself to update the school uniforms and design a collection for my alma mater, Betty Shabazz International Charter Schools. While coming up with the pieces and design concepts, I kept asking myself: how do I make something that is school appropriate, cool and not corny, but also versatile enough to where the designs could be used as educational support to engage students’ interests and imagination? I’m a streetwear kid that hung around the store Leaders 1354 and soaked up knowledge and community amongst other kids who sought purpose and expression in the things we wore. Because of streetwear, I learned to make things using whatever means I had to create something impactful that I and others were emotionally connected to. I kept the same energy while making the “We Real Cool” collection. Currently, up to eighty percent of CPS schools enforce a mandatory uniform policy. Interestingly enough, recent studies show no significant relationship between uniform policy and academic student achievement. While a major number of school leaders advocate for a uniform policy, there is still no academic consensus that uniforms affect school atmosphere or student achievement. The thing that concerns me most is rethinking our approach to uniform policy so that it is innovative and ensures a positive impact on students. I believe this can only happen when school uniforms hold a unique meaning to students and the school culture. Without meaning, there is no purpose. Most standard CPS school uniforms consist of navy blue or khaki pants, paired with a polo or collared shirt that may or may not be branded with the school’s logo. This formula for student uniform in my opinion is not the most exciting, and is honestly pretty boring. 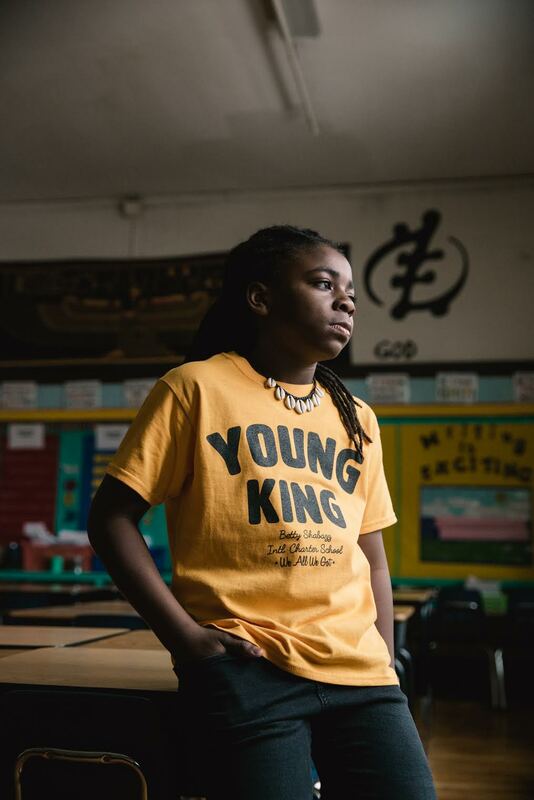 A majority of students feel unable to connect with CPS uniforms that are supposed to foster and instill a sense of pride, community, and self-confidence. Without a unique meaning, students have a tough time connecting to school uniforms or giving it any sentimental value. That disconnect is where I want to help. I want to rethink and update how we approach the way students dress for school. 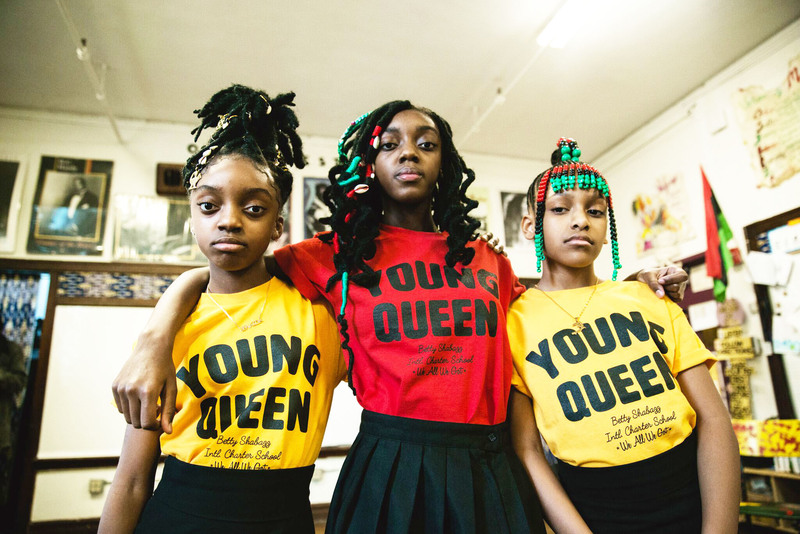 I want the clothes that I’ve made for Shabazz students to be more than just shirts, I want them to be an esteem booster, a reminder that they can be who they are, but most importantly I want these clothes to encourage students to find solutions when things don’t work…and make it look cool. “We Real Cool” is me letting the youth know that I’m paying attention and I’m listening. This project is also an educational effort in the sense of me attempting to push for innovative and creative approaches that demonstrate school and life values, all through clothes. In collaboration with Chicago Votes, the Midwest Culture Lab, and Betty Shabazz, I’ll be releasing a collection and lookbook for Betty Shabazz in February 2019. In the same month, I’ll also be putting together a fashion show featuring the students of Shabazz as well as a benefit banquet. For next school year, I plan to provide all 300-plus Shabazz students with at least two pieces from the collection. My goal is to raise enough money to have this goal realized. We often think of clothing as a material commodity, or possibly a sign of class distinction, but clothing represents so much more than just the economic status of the person wearing it. Clothing can represent a sense of community, one that encourages others to find similarity in one another as opposed to difference. Clothing can represent a sense of self-expression, giving its wearer the chance to think about the different messages and energies that they are putting out into the world. Clothing can teach students that while there may seem like there is so much out of their control, what is often important is focusing on crafting what they can control. This is so worthy, inspiring, cool and ambitious. I wish students in the schools in the Bahamas had access to Desmond “Des Money” Usuwu’s designer uniform(s). — Whitney S. Mortimer King, Nassau, N.P., The Commonwealth of The Bahamas 242.